Duvel Single Fermented Belgian Golden Ale (ABV 6.8%) is brewed using the same ingredients (water, two-row summer malts, Saaz and Styrian Golding hops) as Duvel "classic" (in bottles) but classic Duvel undergoes a second fermentation in the bottle, while Duvel Single Fermented is cold filtered and, after 30 days of conditioning, packaged in kegs and cans. 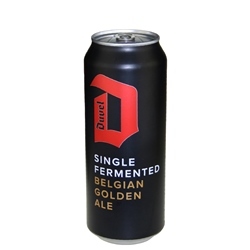 Duvel Single Fermented is reminiscent of classic Duvel, but it has its own unique characteristics. Lower in alcohol (6.8% vs 8.5%), it's dry and crisp with mild yeasty citrus notes, and more hops on the palate than in the nose. The beer is carefully balanced so that hops play off equally with malt and citrus, and is intentionally not heavy or complex. Pouring golden-blonde, with fine soft carbonation and a large head with good retention, the beer is transparent with no residual yeast. Aroma has subtle citrus notes, and a gentle herbal, green hoppiness. Light on the tongue, smooth, bright, and crisp, it's brewed with drinkability and refreshment in mind – it's easy to have more than one! The Duvel Moortgat Brewery was founded in 1871 by husband and wife Jan-Leonard Moortgat and Maria de Bock. Their brewery farm joined an already crowded brewers market (some 4000 distinct breweries existed in Belgium at the time) but hard work, tenacity, and the brewer's craft evident in their top-fermented ales enabled them to build a loyal customer base. By the turn of the 20th century, the brewery's reputation for quality was firmly established and it had become a family enterprise as sons Albert and Victor joined the business. The end of the First World War saw the introduction of "Victory Ale," a beer whose recipe was modeled after great English ales of the time; soon renamed "Duvel," the brew became a sensation locally and then internationally, and remains to this day the brewery's flagship ale. Still overseen by a fourth generation of the Moortgat clan, Duvel Moortgat today is an international brand with presences in Belgium, the Czech Republic, and the United States, and distribution worldwide.